Decreased waste costs, increased recycling and the promotion of sustainable values within the community. 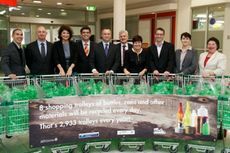 It's a win-win-win situation for Marrickville Metro Shopping Centre in Sydney, who last year launched the AMP Capital Shopping Centres national recycling initiative, funded by the Australian Packaging Covenant and the NSW Environmental Protection Agency. The program involved the installation of new colour-coded and clearly-signed recycling bins throughout the centre along with the creation of a dedicated back of house waste and recycling area to provide away-from-home recycling facilities for more than 5.6 million customers who visit the centre each year. The previous bins were large and only offered general waste disposal to the public. Uptake by customers was immediate and positive, and the tenants actively adopted the new systems. Education training was provided to clarify acceptable materials in each recycling stream. Since the program's inception, Marrickville Metro has improved its comingle recycling (plastic and glass bottles, aluminium cans and containers) from an average of 150kg/month in 2012 to 750kg/month in 2013, a fivefold increase. This initiative has not only impacted comingle recycling but has encouraged the uptake of other recycling initiatives, such as soft plastics and organic food waste recycling, while also reinforcing others such as cardboard recycling. In comparison to 2012 recycling has improved by 30%. "When the recycling initiative is seen as a whole, a cost benefit of approximately $120.30 per tonne is achieved at Marrickville Metro," said Oliver Batchelour, Senior Consultant, Waste Audit and Consultancy Services, who worked on the program. "This is half the cost of waste sent to landfill and is integral to mitigating rising annual waste costs." Other businesses wanting to increase their recycling and reduce waste can find a free step-by-step toolkit at Planet Ark's BusinessRecycling.com.au and use the NSW Environment Protection Authority's Bin Trim program to measure their waste.